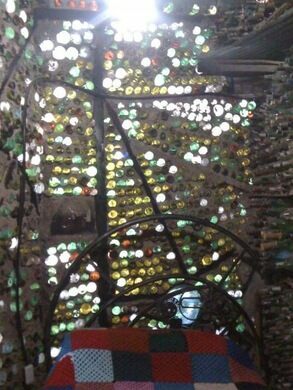 Ingenieri lives a ten-minute cab ride away from the city center in a self constructed house with walls made almost entirely of salvaged bottles. A professional artist and teacher at the local high school, Ingenieri has spent the better part of two decades building the home, which consists of a small main house with a working kitchen and bathroom, a workshop and storage area, and walls that line the property. An additional three-story tower in the center of the backyard remains a work in progress—although presently a wall-less iron structure with wood planks for floors, Ingenieri has plans to one day turn it into a lighthouse. 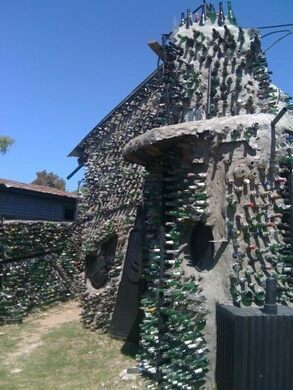 One imagines that the hundreds of bottles piled throughout the front and back yards (some sorted by color, others mixed in with other salvage in seemingly random mounds) will one day end up as a part of this new project. Ingenieri says he has thousands more stored off-site, many of them collected by and given to him by the town’s municipal government, as well as by neighbors and friends. Ingenieri’s collections fill the main home’s interior—bicycles, masks, eyeglasses—either as standalone objects or re-purposed into sculpture. The low ceilings and few windows give a cave like feel to the space, which Ingenieri has filled with handmade tables and chairs that rest on an attractively uneven wooden floor. A curtain made from long film negatives covers the entrance to the small bedroom, and the walls made of glass bottle and the cement that holds them in place create a uniquely dim, multi-colored light. A large wooden door, the only one in the house’s interior, separates the bathroom from the main area, where Ingenieri keeps his stacks of CDs (mostly 60s psychedelia—the artist has a particular fondness for Jimi Hendrix) and art made by him or given to him by friends and admirers. 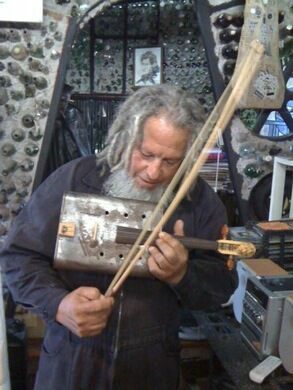 In a box by the stereo, Ingenieri keeps a violin he made out of a tin of kerosene. He doesn’t know how to play, he claims, but enjoys trying to keep up with the music he listens to nonetheless. The short and jovial Ingenieri identifies the science-fiction comic El Eternauta - written in the late 1950’s by Argentine Héctor Oesterheld - as one of his greatest influences. This fact comes as no surprise to the visitor, given the dozens of images throughout the home and yard of the comic’s main character, Juan Salvo, wearing his characteristic scuba mask. A painted, wooden sign propped up against a pillar on the tower’s ground floor (currently occupied by Ingenieri’s welding machine and used as an outdoor workspace) advertises a theater devoted to the work of Antonin Artaud, another of Ingenieri’s great influences. Not yet built, the artist has plans to move onto the theater’s construction once he has finished with central tower. Ingenieri hopes that all of his projects communicate a new perspective among viewers of available materials and their uses, and encourages others to adopt his building style. A vibrant street away from the typical tourist track, lined with colorful, mosaic-covered houses. The narrowest house in Buenos Aires is less than 10 feet wide.